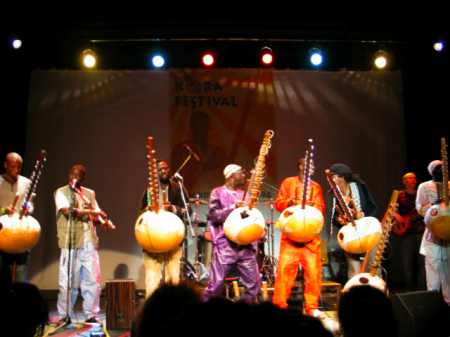 This weekend we went to the first ever Kora Festival in the UK (maybe in Europe) at Brighton. The kora is an amazing 21-stringed African instrument a bit like a harp. It sounds just wonderful and is very beautiful but difficult to play. Some of the world’s best players gathered and ran workshops and performances all afternoon culminating with most of them on stage at the same time at the end. It really was wonderful and we met up with load of people we knew there from the drumming and African music world. We stayed in a b & b for a change as it would cost more in fuel than a hotel to take Moon Palace and on the way home we visited my dad and his wife which was lovely. 21 string? Now that’s complex. Never heard of that instrument before. But they don’t seem to play it sitting down? it looks great, do you have a link to listen to any of the music? I’d love to hear some. That has to be a really challenging instrument to learn to play. Sometime when I”m at school and have high speed, I’ll have to see if I can download some music of these instruments.